On December 16 1770, Ludwig van Beethoven popped into the world, no doubt humming the first few bars of his “9 Variations on a March”. This means 2020 is the 250th anniversary of Beethoven’s birth, and Vienna is already gearing up for a feast of events to celebrate the milestone. I’ll be listing all the key dates and activities below as I hear of them. The Theater an der Wien announced six performances for March 2020. 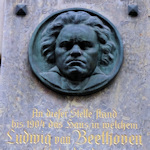 Although born and raised in Germany, Beethoven spent most of his life in Vienna, arriving in his early twenties in 1792 and remaining here until his death in 1827. The city is peppered with Beethoven landmarks, including the Beethoven Museum, his grave, and more memorial plaques than you can count, thanks to his habit of moving house frequently. It’s hard to wander more than a minute or two in Vienna without finding somewhere the great composer lived, stayed, ate, composed or performed in. The formal designation for the anniversary year is WienBeethoven2020 (Wien being the German for Vienna), with a coordination office in Auerspergstraße under the leadership of Dr. Susanne Schicker. Her motto is (my translation) “Beethoven for all and not just the few”. Dec 16, 2019: Official opening at the ceremonial hall of the Rathaus (city hall): details TBA. Dec 16, 2020: Closing event (also in the Rathaus ceremonial hall): details TBA. February 1/2: Members of the State Opera House will perform all of Beethoven’s songs in the Gustav Mahler Saal of the opera house. January 19, 2020: A matinee at the State Opera House which introduces Beethoven’s Fidelio, the composer, and the Staatsoper’s staging of the piece, with discussions with performers. February 1, 2020: Premiere of Fidelio (in the original Leonore version) at the Staatsoper, conducted by Tomáš Netopil and driected by Amélie Niermeyer (with a livestream online). Further performances February 5, 8, 11, and 14. The Wiener Symphoniker (the Vienna Symphony Orchestra) is building up to the 2020 event by releasing all of Beethoven’s symphonies, based on live recordings from a cycle of performances in 2017 at the Musikverein and featuring conductor Philippe Jordan. May 4-14, 2020: The University of Music and Performing Arts hosts the 16th International Beethoven Piano Competition for young pianists. Traditionally, the public can attend each round of the event. Rodolfo Leone took home first prize last time out (2017) with his performance of Piano Concerto No. 5 (the “Emperor Concerto”).